Encyclopedic knowledge: What is an integrated ceiling? The integrated ceiling appeared in 1997. With the rapid development of society, the use of integrated ceilings has also rapidly spread. In 2010, the market demand for integrated ceilings exceeded 10 billion. 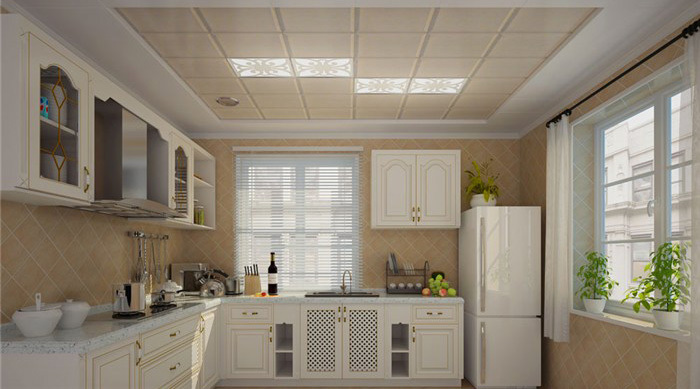 Due to the low technical content of the industry and the low threshold of entry, coupled with the lucrative industry, companies entering the integrated ceiling industry have increased substantially. In 2013, 500 companies, large and small, were engaged in the production and sales of integrated suspended ceilings. Although 80% were small businesses and only 50 brands formed scale, their development was rapid. As market demand increases, market competition will also become more intense. The integrated ceiling is a perfect combination of the ceiling material aluminum buckle plate and ceiling electrical appliances, and is functional, random, overall planar, perfect, is the most fashionable and most popular new type of ceiling mode. Simply put, the integrated ceiling is to make the ceiling module and the electrical module into standard modular modules, which are integrated when installed. 1. Beautiful â€œtopâ€: Different from the effect of installing bathroom heater or ventilating fan or lighting on the ceiling of the kitchen and bathroom. After the installation of the integrated ceiling, it is no longer a hard combination, but a beautiful and coordinated top shape. 2. Function "top": Independent heating lamp, independent lighting, independent ventilation fan, can reasonably arrange the installation position, overcome the defects of the traditional bathroom installation location, can be installed in the heating lamp directly above the lighting, lighting Installed in the middle of the room or on the sink, the ventilation fan is installed directly above the toilet so that each function is placed in the most needed space. 3. Durable "top": Traditional Yuba products combine many functions in a rigid manner and are packaged in a bottom case. In this way, due to the very high power, the machine temperature will increase, which will reduce the life of the components. After the separation of the functional modules of the integrated ceiling, an open-split installation method is used to increase the life of the electrical components by more than three times. The current aluminum buckle plate and electrical specifications are generally 300*300mm, 300*450mm, 300*600, and other minor manufacturers have special specifications. 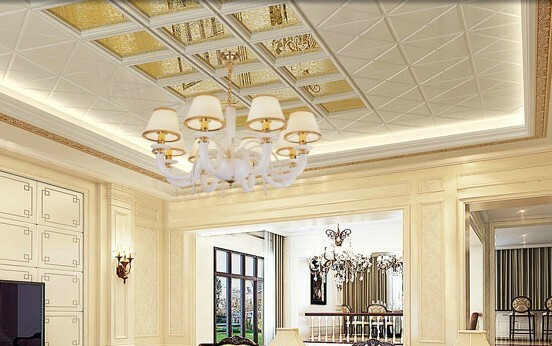 Ordinary ceiling: also known as traditional ceiling, common PVC plastic steel ceiling, strip buckle board ceiling, wood ceiling, gypsum board ceiling, long aluminum buckle ceiling, sauna ceiling and other suspended ceiling. 1, plate style and more. Square moments, smart combination, colorful, film, surface treatment, sturdy, durable. The ordinary board surface is not easy to clean, easy to deform after installation, and the disadvantages of aging will be eliminated. 2, high heat and low consumption, double warmth. The heating bulb adopts a low color temperature design, the efficiency of converting electricity into heat energy is greatly improved, and her strong heat, let a small space become a warm hall, using human skin matching infrared wavelength range, relatively low power, people in Energy is warm and at the same time, only a small part of the electrical energy is converted into light energy, and people's eyes are no longer dazzling and uncomfortable. 3, the integration is good. The original Yuba products are split into several modules, which are freely combined and integrated with heating, ventilation, lighting and ceilings. 4, ceiling performance optimization. Choose a variety of space and life. The light is heated, avoiding the hot head and cold feet; expanding the air intake, avoiding idle idling; combining face-to-face ventilation and avoiding the influence of high temperature and dead angle of the light; the smart combination of the plates, and the integral design of the installation can avoid the laborious consumables. 5, good security performance. The plate has good toughness and high top flatness. The plate is made of anodized plates imported from Germany. The surface is sturdy, durable, naturally isolated, neat and with good insulation, not easily deformed, aged, short-circuited, easy to disassemble, easy to scrub, and reduced by two. Wasted, easy to upgrade. Crazy price war. We have found that integrated ceilings are cutting prices almost every day. You get 10% off, I get 20% off, he has 25% off, and the brands compete for "price reduction." Consumers cannot judge the price of a product or its quality. No-names are rampant. Because of the huge profits of the integrated ceiling industry in the past few years, many people became jealous and they all participated. As a result, one can imagine the result that various products are uneven and disrupt the market. There are about 300 brands in the market, but no more than 50 brands are truly powerful and have brands. Now there are many varieties of pinch on the market, such as coated sheet, nanoplate, roll-coating board, frosted board, etc. The roller-coating board is directly painted on the aluminum board at a high temperature of 280 degrees. It is environmentally friendly and non-toxic (low formaldehyde emission. National standard 15 times), not easy to change color. The film is glued with a film of PUC. One is not environmentally friendly (including formaldehyde) and the other is discolored quickly (it will change color in the sun for two hours), so it is best not to choose a film. Look: The surface of inferior buckles looks uneven and there are particles. The high quality board looks very flat and the panel is soft. Smell: When using a lighter to burn a corner of a defective board, it will scorch in 30 seconds, and there will be a pungent odor of burning charcoal. Even if it is burnt to anti-pollution, it will not have a pungent odor. Touch: The temperature of the surface of the coated plate is the temperature of the plastic, so it is relatively high. To warm it up, the temperature of the plate is the temperature of the metal. Listen: With the corner of the hand-held panel, gently tapping the center of the panel, the sound of the membrane is boring, and the sound of the roller-coating board is crisp. Scraping: The difference between roll-coating and roll-coating is that the poor roll-coating will have a slight burst when it is bent out. Scratching by hand will scrape off the surface layer. A good pinch plate will not. (Be light and flat) The thicker the better, there are many people think that the thicker the buckle, the better. In fact, the thickness is not necessarily good. The international standard of the aluminum buckle is 0.5mm. There is a black seam in the middle of the aluminum plate. . The aluminum used in the roll-coating is made of aluminum, magnesium and manganese. The higher magnesium content is about 1.3-1.8% to increase the elasticity of the machine. The addition of manganese can increase the machine's capacity. The rigidity of the material is about 0.1-0.3. Depends on the quality of the aluminum used, the poor quality of the aluminum plate can only increase the thickness to ensure rigidity. And there is no toughness. So it's not thick enough. It's not good to shake your hand and feel buzzing. Surface coating, different areas with different gussets, the kitchen to use anti-oil aluminum, and the bathroom can choose some soft and warm romantic colors, of course, the key to match your home's overall style, such as wall tiles, floor tiles , And the color of cabinets. How to choose a brand: Regular brand products generally have a brand protective film on the board side, metal side of the ceiling also has a brand of steel stamps, on the back of the factory date, brand name and ISO9001 international quality system certification of computer coding, small manufacturers of products on There is no such branding or it is vague. 1, flame retardant. Because the kitchen and kitchen are the worst places in our family for fire hazards. Environmental health. Because the kitchen space directly faces our food, bathroom space directly faces our body, kitchen and bathroom decoration, and health are our most important requirements. The current incidence of cancer is getting higher and higher. The main cause of cancer is the polluted environment. Beautiful. 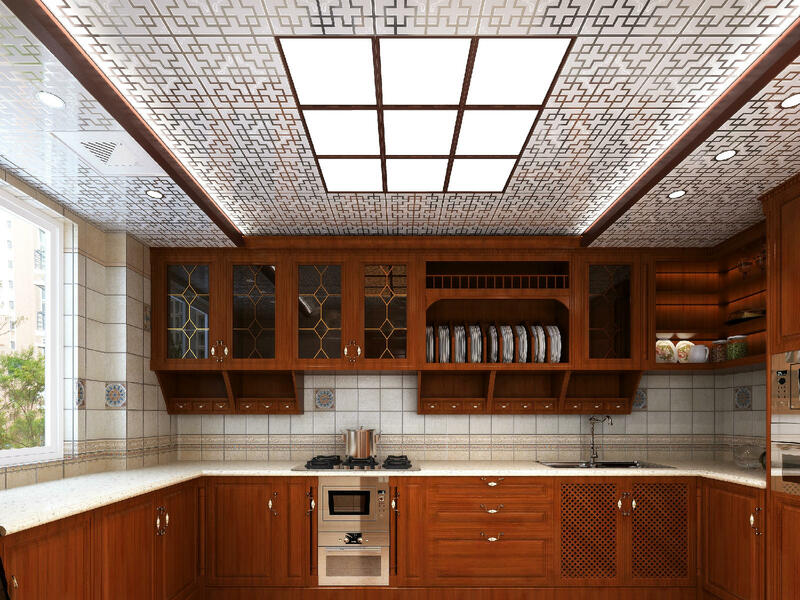 The ceiling decoration of kitchen, toilet and arranging terraces has been developed from the past only to cover the ugliness (covering the upper pipes) and the aesthetic requirements of easy cleaning (cleaning the skins and stains caused by fumes and water vapor). The porch ceiling is an important part of the aesthetic requirements of the overall home improvement. Soundproofing. Because the soundproofing effect of the rooms is generally not good, there are many pipes in the kitchens and kitchens. After the neighbors use it in the future, the sound of piped water will disturb your quiet life. After installing the ceiling, it will greatly reduce the family's noise. 1. Accurately measure the installation area and prepare for installation. 2, install the closing line. 3, hit the expansion screw, hanging boom. 4, install the hook, ceiling mounted light steel keel. 5, the triangular keel with the attached hanging piece is closely attached to the vertical direction of the light steel keel under the light steel keel. 6. Press the pinch plate into the triangular keel joint and make sure that they are perpendicular to each other. The height of the house is critical. If the floor height is very low, even less than 2.5 meters, then it is not appropriate to integrate ceilings in large areas, but it is possible to integrate ceilings in small areas, such as a dozen or so centimeters wide and 10 to 18 centimeters high around the house. The light that is illuminated upwards while keeping the original height in the middle can be painted with a light blue paint. This will make the top surface look as high as the sky and enrich the top surface. Or you can achieve the same effect by using a partially integrated ceiling in a sheltered part of the room. For high-rise rooms, you can freely choose the method and shape of the integrated ceiling, which can be curved, round, square, shaped top, can also be divided into two or even multi-level integrated ceiling modeling, and can use a large area of â€‹â€‹integrated ceiling To reduce the height of the floor. The decoration boom that began in the 1990s brought many decorative ideas to people. Ornamental techniques such as small gardens, cultural stone decorative walls, and yuhua stone all appeared in realistic designs. In particular, after the massive use of red dragonfly caused by the decoration of the country with a yellow decoration, getting close to nature and returning to nature has become one of the goals pursued by the people. Since the mid-1990s, the design ideas of homes have been greatly liberated. People have begun to pursue a variety of design methods, of which a series of relatively complete design concepts such as modernism and postmodernism are embodied in interior design. This style basically uses cherry wood as the main woodwork buckle surface. At the end of the last century, at the beginning of this century, a kind of imitation club-like design that pursued a smooth and luxuriant style began to appear, and then appeared in a large number of ordinary home furnishings. This style emphasizes the simpler but yet contentless form of decoration, gradually forming the style of black walnut as the main carpentry decorative panel. In the middle, minimalism and minimalism began to surface, forming a style. This is a design style that appeared in the beginning of this century at the end of the last century. Wallpaper was used as a woodworking method to decorate surface materials and combine oils. This style emphasizes the harmony of proportions and colors. People began to color the upper part of a wall with the ceiling, and the wall uses a wallpaper with a faint texture. The whole style is very elegant and quiet, without a hint of impetuosity. Entering the 21st century, the implementation of housing reforms and the emergence of many young first-time homebuyers have given impetus to the emergence of this style. Young people just bought a house, many of them are shy, and this time the real estate is basically based on the rough room (a style without a basic decoration), subject to the constraints of financial resources and the need for renovation, Through the form to emphasize the perception of "decoration", which uses a lot of bright colors. This is a kind of interior style with "petty petty" flavor derived from the influence of minimalism. Especially with the emergence of many single nobles, this kind of petty bourgeoisie appears in a large number of apartment renovations. There are no members such as the elderly and children in the room, so there is no need to consider many functional issues in the decoration, often emphasising an arbitrary peace. Light white gauze with a soft fabric sofa, stacked with a pile of pillows of various colors, formed a lazy atmosphere of the interior space. With the emergence of many modernismism, there has been a retro trend in China, which is the renaissance of Chinese style decoration. Chinese paintings, paintings and Ming and Qing furniture constitute the most important element of Chinese design. However, these re-use furniture prices are expensive and become a big obstacle for fans. Chinese style is relatively free. Decorations can be green plants, fabrics, decorative paintings, and lamps of different styles. These decorations can have a variety of styles, but the main decorations in the space are traditional ornaments such as Chinese paintings, lanterns, and purple sand pottery. The number of these decorations is not many, but it can play a crucial role in the space. European style mainly refers to Western classical style. Emphasizes the use of gorgeous decoration, strong colors, and exquisite shapes to achieve elegant decorative effects. The Mediterranean style has unique aesthetic features. Generally choose the natural soft color, pay attention to the space combination in the combination design, make full use of space, set decoration and application in one, in combination with generous, natural, exudes the ancient noble garden flavor and cultural taste. In Southeast Asian style decoration, materials are directly taken from natural plant resources; wood, rattan and bamboo are the first choices for interior decoration. The American country style attaches great importance to the natural comfort of life and fully shows the plain flavor of the village. Classical with a bit of randomness, abandoning too much tediousness and luxury, with the classical style of neo-classical and neo-classical features, both simple and neat, but also warm and comfortable. The Japanese style draws on the essence of the Han and Tang culture. The space is very simple in design. The furniture is centered on the coffee table. The wooden elements on the walls are used for the checkerboard geometric shapes, echoing the fine checkered wooden sliding doors and windows. The atmosphere of the space is simple and elegant. Pay more attention to the actual function, not more tedious decoration. The interior layout also has the characteristics of both modern and practical, but also absorbs traditional features. In the decoration and furnishings in the integration of ancient and modern Chinese and Western in one, everywhere shows practical and casual. Easy cleaning is one of the advantages of integrated ceilings, and a large number of anti-oil, self-cleaning integrated ceilings have emerged in the market. Because of this, the entire integrated ceiling industry does not attach much importance to the late cleaning and maintenance of integrated ceilings. However, kitchens and other places may be somewhat oily. Even if the integrated ceiling has a strong self-cleaning function, if it is not cleaned for a long time, it will affect the gloss and appearance of the integrated ceiling. 1, the kitchen integrated ceiling cleaning: Under normal circumstances, the kitchen plate will choose more roller coating, there are a small number of drawing, it is a better process among the roller coating, not many people in order to save money When the film is cleaned in the kitchen, the former will be oily, so a small amount of detergent can be used. However, if there is sufficient water to be mixed in, the softer, more absorbent fabric should be used. When you touch the water, you can scrub it. It doesn't matter if you want to use it in the middle. However, when you are on the perimeter, you should use less force. Special attention is not to hard cloth and clean the ball and the like, a scrub will immediately leave a lot of small silk on the bright panel, damage the gusset, this time if the roller coating is okay, if it is a film It's not very good. Another point is that if you are using a cheaper, thicker plate, be careful, because it has a lot of iron inside, not the aluminum-magnesium alloy gussets. Now. When scrubbing with a water-saturated towel for the first time, wipe it with clean water for a second time. Open the window and let it dry naturally. If the ventilation is not good, then use a good quality wipe paper once. .
2, bathroom integrated ceiling cleaning: Generally speaking, there is no oil, just take care of cleaning, often with a soft cloth to scrub with water just fine, one month or two months, with the method of cleaning the kitchen to do You can take care of yourself at a time. The situation in the hallway is similar to that of the bathroom. Or, if it is the kind of difference, then it is better to use less cleaning and cleaning. Usually, you can remove the dust with a soft cloth, because the more you wash, the more The faster it will come out. There is no problem with a good board for ten years. Your cheap gusset will only have three years of opportunity. After three years, it will start to rust out from the edge. In the end, it will be ridiculous, and it will be regrettable. So a tens of dollars and a square, it's not worth it. Metal alloy panels are very resistant to water and scrubbing. Daily cleaning can be cleaned with a cleaning agent, and then washed with water; kitchen between the plate joints susceptible to oil contamination, cleaning brush can be used to scrub cleaning agent, and then clean water; pay attention to the lighting circuit do not touch the water. Editor's summary: The relevant knowledge about integrated ceilings is introduced here. Is everyone's understanding of integrated ceilings further deepened? After reading this, I hope everyone will be able to achieve perfection in the selection of integrated ceilings and installation and maintenance next time! If there is any supplement, we all remember to share it in the comments! Want to know more related knowledge, please pay attention to this website!